Thanks for all the comments so far. You'll notice that as each new post goes live the comments on the previous days' posts are still there but you can't add any more. This just makes it easier to know which ones are new so that we can read them out on the bus. Keep 'em coming. Paris on Monday, so now's the time for all your Da Vinci Code-breaking quests! Hi mum and dad. 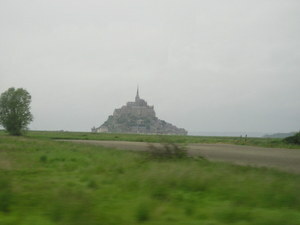 I liked going up the top of the Mont St Michel. I loved the crepes and I asked for it in French. Enjoying playing pool. The food is alright. Hi mum. My roommates are good. We’re going to the Bayeux market tomorrow. I’ll try to get you something nice from here. I loved the chocolate crepes. The Mont St Michel was nice, the rooms are nice, the food is OK.
Hello 2M2. I’,m loving meeting new folks. The travelling is great and I loved ordering food in French. It’s good to share a room with your pals and meeting new people. Looking forward to going on the big rides at the theme park. Missing you lots. Send you a postcard. Lots of love, Robyn. Today we went to Mont St Michel. It rocked! Hey mum – tilly, Miccy, suzie. Food is brill! Hey mum. I’m having a brill time! Hi family! Having a great time. Although the weather could be better. Missing you all. Love ya loads! Well, the English Channel at least. After a relatively quiet and easy trip down to Dover we've met up with our driver for the rest of the trip. Having left you all back home in the rain and gloom of a wet Wednesday night in Musselburgh we arrived in Dover this morning to a beautiful, bright sunrise against the cliffs. We're getting a slightly later boat than expected (7.55am) but will not have too much of a delay in getting to the Château this afternoon. Miss. Leroux. 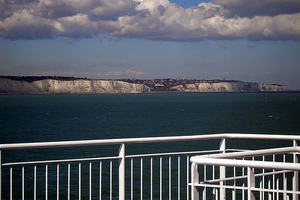 In just over three hours the students and teachers of Musselburgh Grammar will be gathering nervously awaiting the coach (it always seems to arrive late ;-) that will whisk them south to the Normandy coasts and, beyond, Paris. 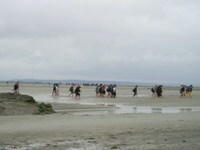 Follow the adventures of 42 students and five teachers from Musselburgh Grammar School online here for the next 10 days. Ask questions, give a mention to your friends and family and give your own reflections on what the students are doing.